Then the selected celebrities and timely politicians, cultural people and choice veterans are asked the usual questions of What Does The Finnish Indepencence Mean To You Personally, and the usual appropriate answers are given. The menu of the tasty things to nibble on is explained and presented in lushious close-ups. Soon the band starts playing dance music (waltzes and tangos) and people rush to the dance floor way too small for the approximately 1900 guests. But lots of ”imitation dance” without room for movement follows, perfect photo ops for the abundant press present. When the photos have been taken, and having left their mark, everybody rushes out of the palace to party in more relaxed settings in various Helsinki restaurants and night clubs where some tv-crews and all the press follow. Next morning the best and the worst dressed are on blunt display in the papers and the net, and the ”Queen of the Ball” is announced. Most problematic was the ”concert”, however, to a great extent planned by the presidential couple. Ms. Jenni Haukio is a published poet and her literary interest is to be applauded. But the program was fragmented by quotes of literature recited by actors of various skills, all with the air of seriousness, put-on importance and solemn gravity. The program commenced ominously, as the Tampere Philharmonics played ”Porilaisten marssi”, the honorary march of the Finnish Defence Forces since 1918, in a version arranged by Jean Sibelius (much advertised in the pre-event press for eliminating the gun-shot sounds of the usual arrangement). To illustrate it for tv-viewers, the whole duration of the march was used to follow the presidential couple descend the stairs slowly (awkwardly) to front orchestra and their seats in the middle of the crowd with the whole audience in silent standing ovation. It might have followed an aged protocol but the impact did not honor the much liked presidential couple nor make great tv-programming. The combination of pompous military music, taking painfully long steps down and standing ovation reminded me of the entrances of Putin to show off importance, or Chinese leaders in official communist congregations. Why on earth didn’t anyone in the production team dare intervene and to look for the interest and image of the presidential couple! What is it about the Finnish idea of a ”proper” celebration! Why does everything have to be so serious, deathly serious, and gloomy? Why is indepencence not a happy thing? Why does ”celebratory” in this context only refer to the worship of the dead, of suffering and sacrifice, of remembering the wars, the famins, the miseries of our long gone past? The music of Sibelius in short fleeting passages connected the chosen bits of recited literature. The sublime soprano Soile Isokoski’s talents were wasted for two melancholy, hopeless hymns. The gifted young baritone Waltteri Torikka could not show his claws with the material given to him. There was a motionless young boy lying on the stage, being patted by a woman in olden peasant costumes. Was the boy malnourished or dead (remember, the great famine of 1866?) or was he dosing off as an ”homage” to democratic Finland’s health care system and it’s recent scandal of flu-vaccination causing sleep apnea? There was the most populist of choice of performers present in the actor Vesa-Matti Loiri, loved by the nation for his silly movies of lowest-caliber fart humor (picture alcoholic man who never washes, smiles thru rotten teeth, wears a worn&torn t-shirt –and it aint fashion-ripped– and yet succeeds where he never should). Well, the actor SINGS, too, and has developed a style so very self-important and ”deep” on ”interpretation” that one shudders. In recent years he has shared in the press much of his battle with obesity –no-one dares mention ”alcohol use” in this context– and on Tampere Hall stage, he happily appeared a bit less obese. But he put on 120% volume on the ”important interpretation” factor of the two very melancholy songs he had, and I almost turned the tv-off. But I lingered on, in awe and horror. When the singing choirs, dressed in various monastery cloaks, started to descend down the orchestra ailes, holding candles and most serious faces, and we ended up with the predictable must, ”Finlandia” by Jean Sibelius, I asked in my mind: whose f…..g funeral are we at? Is this all the music Finland has to offer that is ”suitable” for the occasion? Does ”Independent Finland” only mean sadness, famine, death, gloom, coma by doom, hopelessness, imprisonment by winter, masochism, lethargy? In our accepted view on the Finnish Independence, and on that Tampare Hall stage to celebrate the occasion, where was and is our energy, joy, optimism, where the mischievous sense of anarchy and humor through which we truly have survived in the severe climate of the North and under both Swedish and Russian oppression? Where is our cunning and ”underdog” cleverness? Where is the current, modern multiethnic Finnish society, where are our young people, where is our future? And is there no classical music in Finland since Jean Sibelius (who stopped composing in 1931), and no worthy popular music since Lasse Mårtenson’s ”Myrkyluodon Maija” tv-series of the 1970’s? And last but not least, ”a topic that never must be touched”: the war veterans of 1939-45 who fought against Russia. Kudos and thanks to them, we did not become a total Soviet satellite! As if this live broadcast from Tampere wasn’t enough, the national tv-channel topped it with the original and nowadays canonized 1955 black-and-white film version of Väinö Linna’s ”The Unknown Soldier” about the Finnish war with Russians in 1941 (why not the newer and morally more complex 1985 version by Rauni Mollberg), and with a rerun of the last World Championship ice-hockey game where Finland beats Sweden. 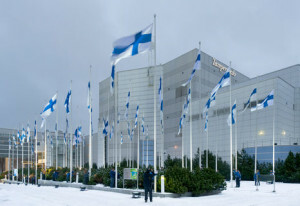 The Finns have long been pathologically interested in the outside views of others on Finland. Commitees of ministers, masters, professors and scientists, experts of industry and education have spent weeks and years in planning ”branding strategies” for Finland to help create a positive image of Finland in foreign countries.